*Bank Holidays: The Showroom, unless otherwise advertised, will be closed over Bank Holidays. All climbers must be assessed by our instructors before climbing unsupervised. If you are new to climbing you will need to enrol in an in introduction course. *Students will be requried to present a valid NUS card. We have everything from guided sessions to membership, clubs for kids & teens and special offers for adults too! Learn from our qualified instructors in introductory sessions & groups sessions. 2:1 ratio // up to 10 minutes including equipment – perfect for first time climbers. 6:1 ratio // 2 x 90 minute sessions including equipment. Introduction to unsupervised climbing indoors, including wall safety and techniques. 6:1 ratio // 90 minute session, great for birthdays, hen and stag dos! 60 minutes with CWA qualified Instructor learning advanced techniques including personal climbing , rope techniques and more. We are now offering Advanced Coaching Clinic for experienced climbers who would like to develop specific skills. From technical movement to strength and conditioning training, you can set the agenda for your Advanced Coaching Clinic and we will tailor the session around the skills you want to improve or learn. Clinics are available to any experienced climbers, just get in touch with a member of the team on 01522 508376 to start planning yours. 60 minutes with CWA qualified instructor. 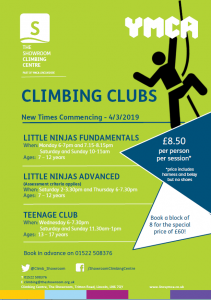 Climbing Clubs for 7-17 year olds! For availability and to book contact our climbing team on 01522 508376 or email climbing@theshowroom.org.uk. The Showroom Mobile Climbing Wall is available to hire for events. At £495, you can access the wall, equipment and qualified instructors for a day. We can also offer the mobile wall as part of an activity day package for schools and community events. To hire the wall or for more information call The Showroom Climbing Centre on 01522 508376 or email climbing@theshowroom.org.uk .